Snapchat Geofilters and Snap Ads are the cheapest and most effective way to connect your company/brand with a millennial audience that simply cannot be accessed via traditional media channels. We are trusted by local businesses and multi-national industry leaders alike. We've worked with businesses, agencies and bloggers to promote their brands to a Snapchat audience. Geofilters are fun overlays we create to allow Snapchatters to decorate their Snaps using your message. When Snapchatters are in the location of your choice, your Geofilter will appear in the app. They’re a great way to engage with your customers, increase brand awareness, and reach new communities! With a Geofilter we can design an asset that ties your business to its location and environment adding a new layer to your customer's experience. 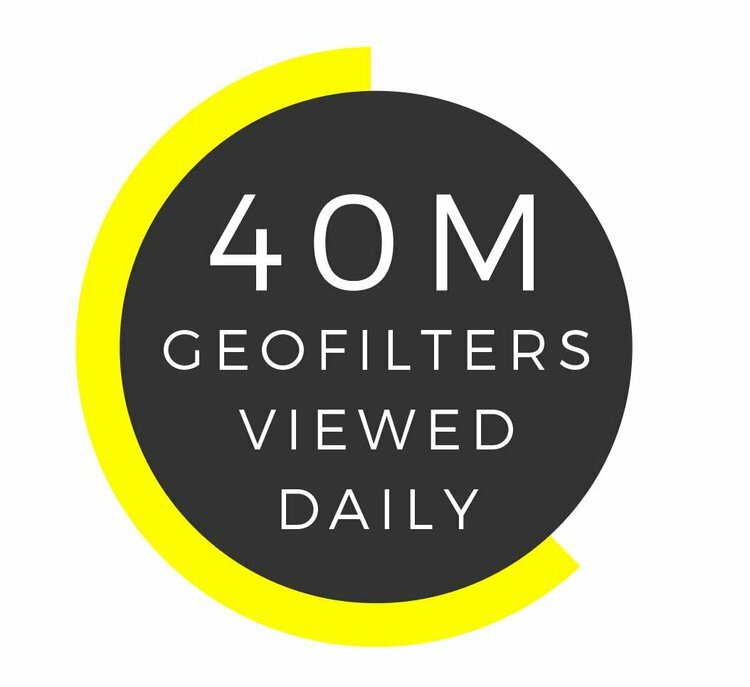 Geofilters create a visual word of mouth truly made for mobile. No launch event is complete without a branded geo-filter. It is a cost–effective and engaging way of increasing brand awareness on the night of your event. L’Oreal hosted an event in Shoreditch to launch their new Colorista range. They knew they had journalists and bloggers on the guestlist who had a large Snapchat following to tap into. Show your customers, employees and shareholders how digitally savvy your business is with a geo-filter at your conference, company party or annual meeting. Gleam were hosting their summer party and wanted the creative to reflect the incredible venue of Cliveden House where they were hosting the event. This allowed them to use their summer party to amplify their profile. Snapchatters love to take snaps at entertainment venues to ‘show-of f ’ to their friends what they’re doing. Make sure visitors spread awareness of your entertainment venue with a branded geofilter. We facilitated one of the largest UK bar chains, Revolutions, in covering all of their venues over the Easter Bank Holiday to promote an Easter egg hunt they were holding. Create a digitally immersive in-store experience by simply adding a geofilter. This will ensure snapchatters are letting their online community know that they are shopping in your store. Uniqlo wanted to draw attention to their new collaboration Star Wars with two filters, one for the rebels and one for the empire, allowing customers to show their allegiance. Target a large audience over multiple locations to create mass awareness of your brand. We can choose areas which have a high density of your target audience all over the country. Sony Pictures wanted their filter to be available around highly populous bar/club areas across the UK. We geofenced areas for 2 weeks. This strategy helped to reach their target audience and minimise wastage. Why not keep your geofilter running all year long and have a permanent presence over your business? With the annual plan, you’ll own your “airspace,” be able to change the filter design as often as you like and unlock extra reporting metrics. The Tate are using our services to geofence the Tate Modern and the Tate Britain for the whole year. We will be swapping the creative several times throughout the year to keep it up to date with the exhibitions and events they are running. Snap Ads are captivating 10-second vertical videos which play between Snaps. Your ad can link to a long-form video, drive website traffic, encourage app downloads or simply build brand awareness. As part of Thomas Cook's in-resort recruitment drive we ran Snap Ads intermittently throughout the first quarter of 2018 encouraging people to apply for the available roles. The ads were an engaging look into life as a resort team member targeting 18-25 year-olds who were adventurous travel enthusiasts. The ad saw a great response from potential candidates and had a swipe up rate 3 times higher than the average Snap Ad campaign. We've been lucky enough to have some fantastic clients and some brilliant briefs. Check out a selection of our work below to see what your brand can achieve with a Geofilter.